We (Drs. Brodale, Edeen & Young) are just back from the 2nd Amendment Foundation’s Gun Rights Policy Conference in Chicago last weekend. It’s the pause that refreshes, recharges and restores our drive to spread respect for the vital significance of the 2nd Amendment today and tomorrow in America. Our talks there are going on the website this week and next. We’ll alert you to audio/video on DRGO’s YouTube channel when it becomes available. Every year we go, we make new friends and strengthen old relationships. It looks like we’ll be of help to even more of our fellow activists, and that they’ll further promote the work we do. This is a critical moment in American politics, with the nomination of the 5th conservative justice to SCOTUS hanging in the balance and mid-terms coming up that could either reinforce gun rights progress or undercut hard-won gains recently made. DRGO does not endorse any candidates. But please, make your voice heard! Work for your choices, get friends to register and VOTE! 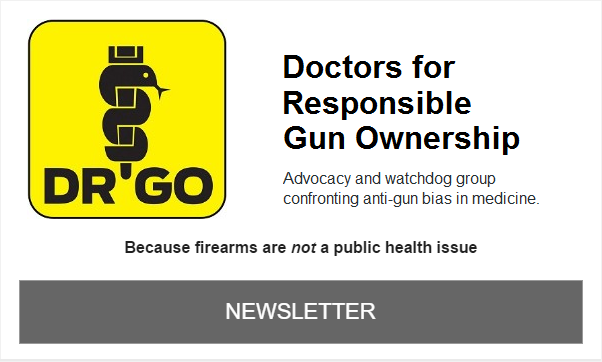 Doctors for Responsible Gun Ownership. On September 27, we published an expanded version of Dr. Young’s talk from GRPC (9/23) “Who Are Mass Murderers and Why Do They Kill?” Hint: they are hard to identify until they act. In this case, the best offense turns out to be good defense. We posted Dr. Brodale’s 9/23 presentation at GRPC “DRGO versus Anti-Gun Pseudoscience” on September 25. He took down two recent examples of inane “studies” from the medical press. One pointed out an absurd correlation between incidence of opioid abuse and voting for Trump in 2016; another imagined that “gun violence” drops because perpetrators attend the NRA Annual Meeting. September 17 was the 230th anniversary of the adoption of the U.S. Constitution by the 1787 Consitutional Convention. Dr. Young wrote about “Constitution Day and Us”on September 18, and how it stands in remembrance as important as Independence Day and the subsequent ratification of the Bill of Rights. ‘MarkPA’ considered “What Constitutes Responsible Gun Ownership?” on September 13. Being well-educated on “gun handling skills and the lawful use of lethal force in self-defense” seems obvious–but can gun control proponents understand that? Drs. Gift & Young raised “Gun Politics Redux, Not Medical Science” on September 11. This covered a study and editorial in the August 28th JAMA with the usual incomplete data, artificial correlations,conflation of causes of death, and readiness to believe that foreign countries’ restrictive gun laws (which don’t reduce violence anywhere) would accomplish anything here. Dr. Brodale was the guest September 17 on Interviews with the Masters with John Stallone, regarding Lead in our Game Meat . . . Copper vs Lead Bullets. Evidence shows that projectile lead is not a substantial health problem, so long as one cuts around the bullet pocket, avoids swallowing shot, and washes up well following time at indoor ranges.